this story is the fact that a lot of immigrants are paying their life savings to smuggling rings in the hope they will get them across to Europe. These smuggling rings are packing poorly made boats or rafts with these desperate people and setting them off to fend for themselves in the world’s busiest sea lanes. British warship, HMS Bulwark leading a boat carrying 369 migrants to safety in waters just north of Libya on May 28. It is currently steaming across the Mediterranean to help courtesy of the dailmail online. The flimsy crafts are floating coffins with unknown thousands already having been lost at sea, one report told us that 500 drowned in a recent trip. What can be done to help? Well, as you seen from the first image, most European countries have sent warships to help an overwhelmed Italian navy in fishing these migrants out of the sea but the issue here is that this migrants are then brought back to Italy and France and placed into the immigration holding stations, adding to the situation which has dogged the EU with ghettos sprouting up all over Southern France, particularly Calais as migrants are stuck in limbo, they can’t go back, they are not allowed to work so they can’t start to build the new life they were so desperate to find. So what is there to do? The EU wanted to reduce the navy escorts to pick up migrants, taking the view that death would discourage them from trying!!! Well that didn’t work. Italy were forced by the EU to step down their rescue action but now the whole fo Europe is having to step in, picking up a large number of them as the fear of death in the sea has not deterred them. The main issue here isn’t whether to rescue them or not, that is a no brainer, most people would agree there is a moral obligation to do so. The Italian and French navies are doing sterling work saving lives. Britain as a world leading power should be committing more of its navy to help but has sent some. But, the issue is, what to do with the migrants once landed. 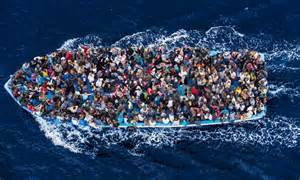 France have said they won’t take any more and some of the small islands in the Mediterranean and Italy are swamped with huge numbers. One solution would be for Europe to joint fund a facility in Tunisia or somewhere else along the North African coast where migrants can go to and legitimately request entry and be protected whilst doing so. The real issue is why they want to leave and an establishment of a ‘safe area’ in this part of the world, a new city if you will with EU forces protecting it would go some way to honourably help these people that are so desperate. This is the only solution to such a massive migration problem – to help on the spot – rather than create tensions within the countries that want to help but fear how they can absorb such numbers – fears which only fuel the further right leaning of an already troubled European zone. Europe along with other world powers should be helping these people by repairing and rebuilding their countries instead of allowing these nations to implode – instead the bureaucrats sit back and watch and do nothing, until we have this moral crisis –Europe should be stepping up and helping its’ former colonies emerge as stable and developed nations – we owe them. Africa should be broken down into areas of operation – linked to ex colonial ties with British forces, French, German and the rest helping alongside democratic supporters – not just to fight and win wars against the terrorisst or corrupt governments but also to re build – something none of the ex-colonial countries have ever done. Just think how fast these nations could bounce back if they had proper engineers from leading companies working with military tech and personnel to rebuild dams, set up water irrigation and put in services we all take for granted – now that would put some meaning into the ‘European Union’ – unite to improve the lot of nations we clearly owe. We Europeans, with our distinct cultures and views can’t look inwards like America and China who base all decisions on self interest – we are a collection of nations and we are the only ones who can and should resolve this. This issue is not about greedy Americans wading in for the oil, or China’s megalomania – it is about ordinary people who want the way of life that Europeans fought for in two World Wars – history shows that from Europe’s raid on Africa the story has come full circle and it is the European people, the European Powers, who are obligated to take action and lead the World in resolving this humanitarian crises – with more than just words.